Christmas Eve arrives with a delightful French-Canadian twist at Richard Ouellette and Maxime Vandal’s Montreal home. The duo, partners in the design-construction business Les Ensembliers, serve a traditional Montreal-style feast—starting with oysters on the half shell and ending with a sweet chocolate cake roll—on a dining table that features an equally tasteful yet unexpectedly fresh palette. Inspiration for the holiday tabletop, which takes an elegant turn from traditional red and green, emerged when the pair recently reimagined their head-turning octagonal dining room in a palette of pale pink, gold, and peacock. Richard designed the fabrics, including a woven chevron that skirts the round table, a geometric-and-animal print at the window, and two shades of velvet—made to appear worn—on dining chairs. Dining chair seats alternate two shades of “Les Ecorces” fabric from Les Ensembliers collection for Brunschwig & Fils. Also from the collection is “Les Vagues” chevron used for the table skirt and “Les Rizieres” embroidered fabric used on the drapery panels. The green “Handmade Gothic” centerpiece vase is from Artemest. Just as he mingles patterns—as disparate as the lucky guests who are invited to dinner—he mixes things up on the table. Dinner plates in soft shades of pink and teal coordinate but don’t match, offering each guest a unique experience on a memorable night. Richard Ouellette (left) and Maxime Vandal prepare for their holiday gathering. Setting an elegant stage for the meal and putting a soft, refined spin on ubiquitous holiday hues, a ribbed pink tumbler blushes next to a suite of glassware, while a large vase in translucent green bubble glass holds an assembly of flowers. “Zanetto” flatware, along with “Cristalleria ColleVilca” wineglasses and the amethyst “Spider” Murano vase, both through Artemest, offers shimmer against the “Callum” candleholder from Blue Pheasant. Richard and Maxime also put their personal stamp on the menu, which spotlights traditional Montreal Christmas fare with an upscale twist. Oysters on the half shell, complemented with champagne, start a dinner that includes creamy pea soup and a hearty yet elegant meat pie cloaked in golden pastry. Even Santa will score: Maple cream-filled French cookies called Belgi Galettes await the jolly old elf. Takeaway cookies are presented in an elegant ivory, green, and blush wrapping that repeats the palette of the dinner. Kim Seybert “Flare” napkin rings secure Frette Bespoke dragonfly napkins on a chair covered in “Les Pivoines” fabric from Les Ensembliers collection for Brunschwig & Fils. Richard Ouellette and Maxime Vandal, owners of the design/construction firm Les Ensembles, serve a refined version of a traditional French-Canadian Christmas Eve dinner to welcome the holiday and the arrival of a certain bearded gentleman in a red suit. The dinner starts late in the evening and is a leisurely repast to be enjoyed after church. Champagne and oysters begin the revelries, and an updated version of a chocolate Christmas log provides a decadent ending. To make things simple, many of the dishes are prepared in advance, placed in the freezer, and finished off just before dinner. Chef Mary Payne Moran, of Hail Mary, Food of Grace, created the recipes. Montreal native Kim Finley provided helpful guidance on menu planning and local traditions. Match Oysters on the Half Shell with classic French Champagne. A yeasty brut (dry) blanc-de-blanc, which is made exclusively from Chardonnay grapes, is a wonderful foil to the briny bivalve. When reading the label, remember that “extra dry” actually is a sweeter, not drier, Champagne. For oysters, transfer shucked oysters to serving plates. Garnish each with lemon wedge, shallot, and parsley. Serve Cognac Mignonette and Tomato-Horseradish Cocktail Sauce on the side. Makes 48 servings. Cognac Mignonette In small bowl, whisk together 1/3 cup cognac or brandy, 2 tablespoons white wine vinegar, 2 tablespoons minced shallot, 1-1/2 teaspoons honey, and freshly ground black pepper to taste. Cover; refrigerate 20 minutes. Adjust seasonings to taste. Tomato-Horseradish Cocktail Sauce Combine 1/3 cup seeded, coarsely chopped Roma tomatoes; 1/4 cup fresh grated horseradish (not creamy); and 2 tablespoons minced shallot. Stir in 1/2 cup ketchup; 1/2 teaspoon each sugar, salt, and freshly ground pepper; 4 teaspoons lemon juice; and 1/8 teaspoon Worcestershire sauce. Mix well. Adjust seasonings to taste. Top with additional freshly grated horseradish, if desired. This light, lovely soup recalls spring with its fresh flavor, making it more appropriate as a first course than a heartier split pea and ham version. Fresh frozen peas—a secret ingredient—preserve the vegetable’s just-shelled flavor. The soup freezes well, so prepping for Christmas Eve dinner becomes much less stressful. In 4- to 5-quart pot heat butter and olive oil over medium-high heat until butter is melted. Add onion; cook 3 minutes, stirring occasionally. Add one package frozen peas to pot; cook 5 minutes over medium heat. Add water, stock, parsley, and dried dill weed. Bring to boil; reduce heat. Simmer, uncovered, 10 minutes. Add remaining peas to pot. Cook 5 minutes or until peas are soft. Puree soup in small batches; return to pot. (Or, use immersion blender to puree soup directly in pot.) Bring to simmer. Remove from heat. Whisk in cream. Garnish servings with bacon and fresh dill weed. Makes 8 servings. Tip: To freeze, place soup in airtight container and freeze up to 3 months. To serve, thaw soup 1 to 2 days in refrigerator. Place thawed soup in saucepan. Bring to simmer, covered, 10 minutes, stirring occasionally. The gold-rimmed Lenox “Westchester” soup plate through Replacements rests on Blue Pheasant’s “Julianna” plate and a Kim Seybert “Patina” placemat. The “Pierre” ribbed tumbler is from Blue Pheasant. The traditional version of this meat pie usually includes ground beef and pork. Using pork shoulder and sirloin tip results in a more elegant rendition. The use of root vegetables creates a hearty entrée with a modern twist that retains its French-Canadian tradition. Making the pie ahead of time and pulling it out of the freezer on Christmas Eve frees you up for more holiday family time. For filling, preheat oven to 375°F. In oven-safe 12-inch skillet heat 1 tablespoon butter and 1 tablespoon grapeseed oil over medium heat until butter melts. Add onion, carrot, and parsnip. Cook 2 minutes, stirring frequently. Add leek, shallot, and garlic. Reduce heat to low. Cook 2 minutes or until tender. Season with salt and pepper. Remove from skillet; set aside. In large bowl toss pork, beef, and sausage with 4 tablespoons flour to coat. In same skillet heat remaining 1 tablespoon grapeseed oil and 1 tablespoon butter until butter melts. Add meat mixture. Season with additional salt and pepper. Cook and stir 5 minutes or until meat is browned. Stir in allspice. Return vegetables to skillet. Remove skillet from heat. Add brandy, return skillet to low heat. Cook until brandy is evaporated, stirring to scrape any browned bits from bottom of skillet. Add chicken stock and bay leaves to skillet; bring to boil. Cover skillet; bake in oven 50 minutes. Stir potatoes into mixture in skillet. Cover and return skillet to oven. Bake 10 minutes more. In small bowl stir together remaining 2 tablespoons butter and 2 tablespoons flour. Remove skillet from oven. Remove and discard bay leaves. Stir in milk, rosemary, and butter-flour mixture. Cook and stir over medium heat until thickened. Set aside; allow to cool. Roll half of crust (see recipe, below) to 14-inch circle. Transfer to bottom of freezer-to-oven-safe deep-dish pie dish. Add filling. Roll remaining crust to 14-inch circle. Place atop filling. Roll and crimp edges. Make five slits in middle of top crust in star shape to let steam escape. Brush top crust with beaten egg. Wrap; freeze up to 3 months. Remove from freezer. Let stand at room temperature 30 minutes. Preheat oven to 375°F. Bake 1 hour and 35 to 45 minutes or until hot and bubbly in center. Cover edges with foil toward end of baking to avoid overbrowning. Let cool 20 minutes before serving. Makes 8 servings. For crust, in small bowl, beat together egg, egg yolk, and 2 tablespoons water. Set aside. In large bowl combine flour, salt, and sugar. Using pastry blender, cut in butter until mixture resembles wet sand. Use fork to mix in egg mixture. Add remaining water, 1 tablespoon at a time until dough is able to form a ball. Divide in half. Form discs from each half. Wrap and chill 15 minutes. Makes 2 crusts. Tip: If baking Tourtière immediately, bake in 375°F oven 45 minutes or until golden brown and bubbly in center. 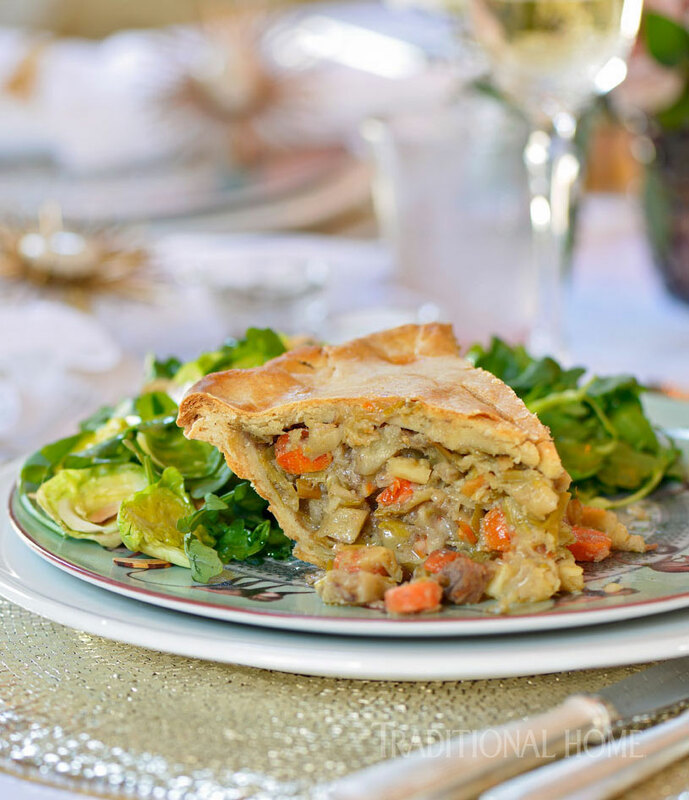 The acid in the bright, citrusy vinaigrette helps balance the rich Tourtière. It’s a pleasant palette cleanser before dessert but also rounds out the main course with its combination of lettuce and Brussels sprouts. All the ingredients can be prepped in the morning and tossed together before dinner. For vinaigrette, in small bowl or blender combine oil, lemon juice, orange juice, mayonnaise, shallot, vinegar, salt, and pepper. Mix well to emulsify using an immersion or stand blender. For salad, in medium bowl combine shredded Brussels sprouts, 1/4 cup vinaigrette, salt, and pepper. Marinate mixture in refrigerator 30 minutes. In large bowl combine arugula, Brussels sprouts mixture, almonds, and 2 tablespoons prepared vinaigrette. Drizzle with lemon juice, if desired. Makes 8 servings. *Tip: To shred Brussels sprouts, remove tough outer leaves and thinly slice each head with a chef’s knife or use a food processor with the slicing attachment. Storage: Place remaining vinaigrette in airtight container and refrigerate up to 1 week. This Chocolate-Caramel Cake Roll plays on the tradition of the classic Christmas chocolate cake, bûche de Noël, without the fussy meringue mushrooms and fondant holly leaves. With or without the gold-leaf garnish, this cake just might enter your entertaining recipe repertoire year-round. Like the other recipes for this celebration, the cake can be made ahead and frozen, then defrosted and iced a short time before serving. Find edible gold leaf in the baking department of a specialty grocer or order in advance from Amazon. Make sure to purchase the edible, not decorative, variety. For cake roll, separate eggs. Allow egg whites and yolks to stand at room temperature 30 minutes. Meanwhile, grease bottom of 15x10x1-inch baking pan. Line bottom with waxed paper or parchment paper; grease and lightly flour pan. Set aside. Preheat oven to 325°F. In medium bowl beat egg yolks, vanilla, and salt with electric mixer on high speed 4 to 5 minutes or until thick and lemon color. Gradually add 1-1/4 cups powdered sugar, beating until combined; set aside. Thoroughly wash beaters. In large bowl beat egg whites on medium to high speed until stiff peaks form (tips stand straight). Fold one-fourth of beaten egg whites into yolk mixture; fold egg yolk mixture into remaining beaten egg whites. Sift flour and cocoa powder over egg mixture; fold in gently just until combined. Spread batter evenly in prepared baking pan. Bake 20 minutes or until cake springs back when lightly touched. Immediately loosen edges of cake from pan and turn cake out onto clean kitchen towel sprinkled with additional powdered sugar. Remove waxed paper. Roll towel and cake into spiral, starting from short side of cake. Cool on wire rack. Unroll cake, remove towel. Spread cake with thin layer of Caramel Sauce. Spread with all Chocolate Ganache. Roll up cake from short side; trim ends. Place cake roll, seam side down, on baking sheet. Cover. Chill 1 hour. Transfer cake to serving platter. Ice smoothly with Whipped Cream. Use fork to make striations that resemble wood grain. Decorate with edible gold leaf. Slice and serve with remaining Caramel Sauce. Makes 10 servings. For caramel sauce, in large saucepan combine granulated sugar and water. Bring to boil over high heat, stirring occasionally. Boil 10 minutes or until desired caramel brown color. Carefully add 1 cup cream and whisk until smooth. Chill 1-1/2 hours or until thickened to sauce consistency. For chocolate ganache, place chocolate in heatproof bowl. Bring 3/4 cup cream to boil. Pour over chocolate (do not stir). Let stand 5 minutes. Whisk until smooth. Chill 1-1/2 hours or until thickened to spreadable consistency. For whipped cream, in chilled bowl, beat 1-1/2 cups cream to stiff peaks. Stir in 1/2 cup powdered sugar. The dessert sits on the “Julianna” platter from Blue Pheasant. Belgi Galettes are wafer cookies made in a pizzelle iron—similar to a waffle iron. These delicate cookies nod to Canada’s culinary treasure—maple—but can be filled with any cream you prefer. They are also a treat with tea. Find a pizzelle maker at most department stores in the small appliance section. We used one that makes 3-inch cookies. For maple cream filling, in small bowl combine maple sugar and milk. Stir to dissolve maple sugar. In medium mixing bowl, beat together 1/2 cup butter, shortening, and salt until combined. Gradually add maple sugar mixture; mix well. Set aside in cool area to allow filling to firm up. For cookies, in large bowl beat together 1 cup butter, granulated sugar, and vanilla until combined. Add eggs, beating until just combined. Add flour and salt; beat on low speed until combined. For each cookie, place scant tablespoon of batter on pizzelle grid, slightly off-center toward back. Close lid. Bake 30 seconds to 1 minute or until just beginning to brown. Remove with offset spatula; trim edges* of cookie, and then place on flat surface to cool completely. Cookies will crisp up upon standing. Repeat with remaining batter. Spread 1 side of cookie with about 2 teaspoons filling. Top with another cookie. Repeat with remaining cookies and filling. Dust with powdered sugar. Makes 24 to 26 cookies. *Tip: Right after removing cookie from iron, place on cutting board. While cookies are still warm, use a 3- to 3-1/4-inch round cookie cutter to even out edges of cookie. Cool completely as directed above. Variation: Use your favorite sugar cookie or shortbread recipe instead of the pizzelles. Spread the batter a bit thinner than normal and shorten the baking time, keeping careful watch on the browning. While oysters are best during the fall and winter months, when they spawn, the adage about only eating them in months spelled with an “r” is no longer true. However, it’s best to buy them close to their harvest points or from a grocery store with high turnover and reliable sources. Purchase oysters as fresh as possible. Reject those with open shells and those that don’t snap shut when tapped. It may be best to pre-order oysters from your fish monger (give at least a week’s notice) so the oysters are fresh the day you purchase them. Oysters may be kept up to three days in the refrigerator covered with a damp towel but are best used on the day of purchase. Scrub the shell with a clean sponge. Place the oyster, cup side down, in a kitchen towel with the hinge end (the narrow end) facing you. Hold the wide end in your hand wrapped in the towel. Insert the tip of the oyster knife, pointed side up, into the hinge. Jiggle and gently twist the knife to release and open the shell. Clean the knife on the towel, then reinsert the knife to fully open the shell. Hold the shell open with your fingers, and using the knife, gently release the oyster from the lower shell. Pop open the upper shell. Discard the upper shell, reserving as much of the oyster liquor (the liquid inside the shell) as you can. Click here to download some of our favorite holiday menus.